The Coronation of St. Joseph by Juan de Valdés Leal (1622-1690). The Church is at a crossroads. The cardinal electors obviously sense this, and that may be the reason they have yet to set a date to begin the conclave, despite Pope Benedict's motu proprio authorizing them to start sooner than otherwise dictated by law. Since we know from history that the Holy Spirit has, from time to time, allowed the Church to be afflicted by a bad or incompetent Pope; and since many -- perhaps most -- Catholics have gone off the rails in recent decades, it is imperative that we pray for the selection of a man after God's own Heart. 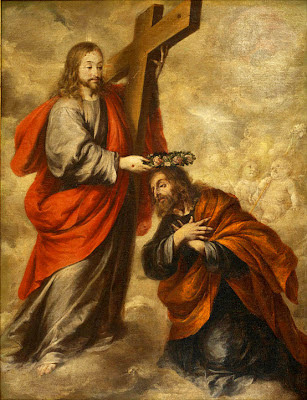 O Blessed St. Joseph, tenderhearted father, faithful guardian of Jesus, chaste spouse of the Mother of God: we pray and beseech thee to offer to God the Father His Divine Son, bathed in blood on the Cross for sinners, and through the thrice-holy Name of Jesus, obtain for us from the Eternal Father the favor we implore. Namely, the election of a holy and heroic new Pope. Appease the Divine anger so justly inflamed by our crimes; beg of Jesus mercy for thy children. Amid the splendors of eternity, forget not the sorrows of those who suffer, those who pray, those who weep. Stay the Almighty Arm which smites us, that by thy prayers and those of thy most holy Spouse, the Heart of Jesus may be moved to pity and to pardon. Amen. That is a good prayer, especially since this is the Month of St. Joseph. I am saying the thirty days prayer to St. Joseph for this same intention. I will say it too. Allies for Victory: Followers of V for Victory! Mary, conceived without sin, pray for us who have recourse to thee! The destiny of mankind is not decided by material computation. When great causes are on the move in the world...we learn that we are spirits, not animals, and that something is going on in space and time, and beyond space and time, which, whether we like it or not, spells duty.